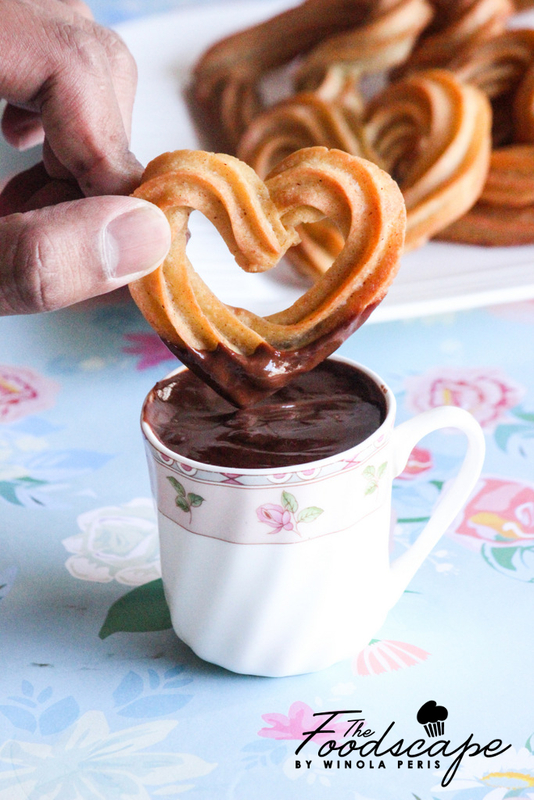 This Valentine’s Day, spread the love with these Baked Churro Hearts dunked in a Dark Chocolate Sauce that is to-die-for! So, since we’re giving the gifts a pass, I make something special every Valentine’s. Something that is unusually lovey-dovey, hearty and that is perfect for the day of love. Last year, I made some beautiful, citrus-y Pink Lemonade Hearts (my fun take on Lemon Bars). This year, I made these crispy, perfectly golden Baked Churro Hearts that are just fabulous! 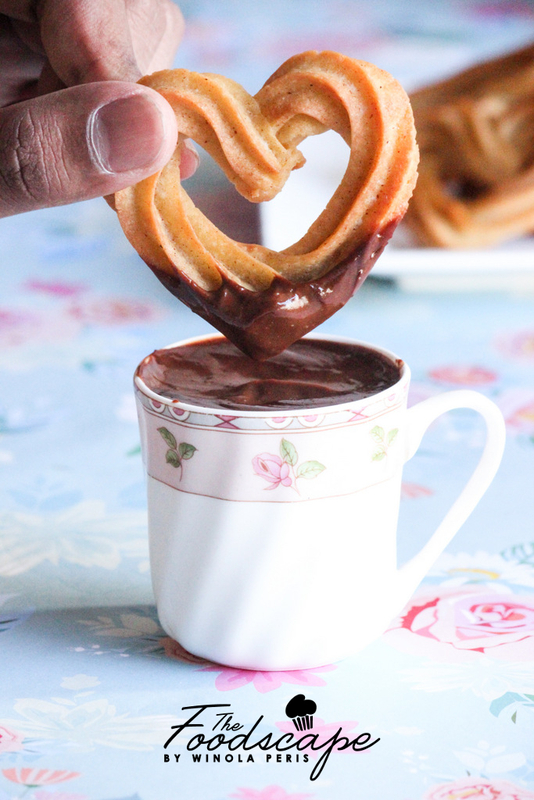 Here’s how you make these darling little Baked Churro Hearts. Place a heavy bottom pot on low heat. Pour in the water, brown sugar, unsalted butter and salt and cook until the mixture comes to a boil and the butter melts completely. Add in the flour and mix until well incorporated. Cook the roux till it starts leaving the sides of the pot and clumps together in a ball of dough. Take it off the heat. Add in one egg at a time, mixing well between each addition. Pour in the vanilla extract and give the batter a final mix. Preheat your oven to 200 degrees Celsius. Using a heart-shaped cookie cutter, trace hearts onto a sheet of parchment placed atop a baking sheet. 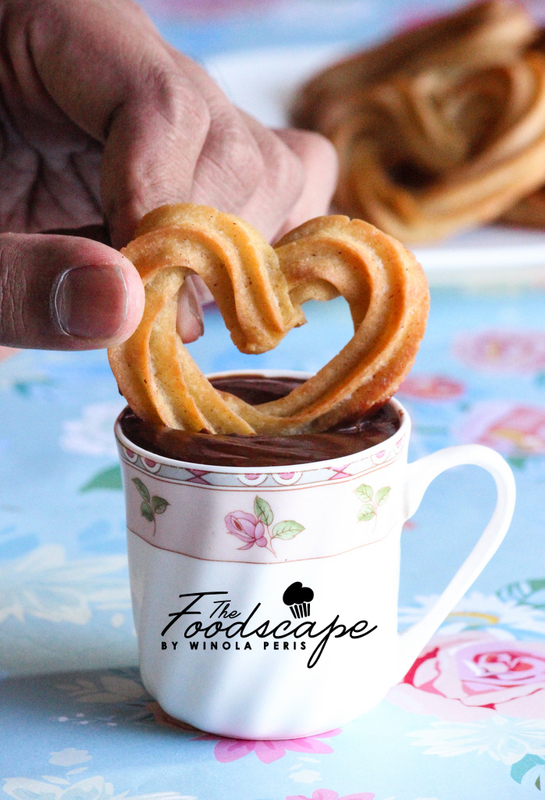 Turn the batter out into a piping bag and using the traced hearts, pipe heart shaped Churros onto the parchment. Then pop the sheet into the oven and bake the Churros for 20 minutes, or until they are baked to crisp, golden perfection. Once the Churros are baked through, dust them with a mixture of ground cinnamon and sugar. To make the sauce, bring the cream to slow boil. When bubbles begin appearing towards the edges, take the cream off the heat and pour it over the chopped chocolate. Let it sit for a minute and then gently fold to make a smooth, glossy Dark Chocolate Sauce that looks so good, you can’t wait to jump right in! 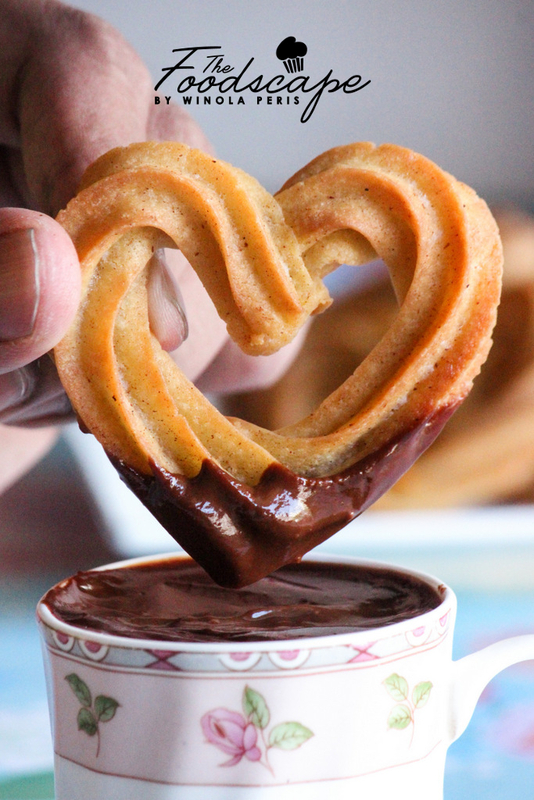 These Baked Churro Hearts are all kinds of lovely! They are subtly sweet, with the warming hint of cinnamon and a beautiful crunch that crackles when you bite in. Dip them into the Dark Chocolate dipping sauce and you’ve got your ticket to lovey-dovey bliss! There are a few things about these gorgeous Churro Hearts that I’d like to point out. They are almost healthy, considering they are baked and not deep fried. (Take the healthy way out, peeps! 😉 ) You can put these Baked Churro Hearts together in under an hour, so if you’ve got plans this Valentine’s, you can make these real quick, maybe as a little surprise for your loved ones! Also, these Churros are far too yummy to miss out on! So I suggest you get baking already!